Because the bulk of my work over the last fifteen years has been in adult books, many people don't recall that I've published a number of children's books with traditional publishers. I've written anything from full-color 32-page simple stories targeted for three to five year olds to older 32-page books for four to seven year olds. Also I've written more than half a dozen biographies targeted to 8 to 12 year old readers. Why biographies? I have always been fascinated stories about other people. The summers of my youth were often spent living several months with my granny in Frankfort, Kentucky. I made frequent trips to the local library and carried home stacks of biographies about various leaders throughout American history and others. With this background, I was a natural to write stories about other people and write a variety of youth biographies. While I wanted to write books in the early days of my writing, I did not jump immediately into books. I honed my writing craft in magazine articles and other shorter forms of writing. I learned to write a query letter to pitch my idea then when I got an assignment, I wrote the article and sent it into the publication. Throughout those early years of my writing, I was building a reputation for excellence in the magazine area and learning about books through writing book reviews. I was the original book review columnist for Christian Parenting Today (which went out of business a few years ago but originally had a circulation of about 150,000 each month). I reviewed books for a number of other publications. I read a broad sweep of children's books, teenage books--fiction and nonfiction. In general, writers do not get much pay for writing book reviews, but you do get free books from the publishers. I read and considered many more books than the ones I ended up writing about for the various publications. At that time several publishers added my name to their list of media who received review copies of all of their new releases. It amounted to hundreds of children's books which came to my mailbox and taught me a great deal about the marketplace in the process of reading that material. Besides reading children's books and writing magazine articles, I was also starting to attend writer's conferences and meet book editors. It is a critical part of the process to form relationships with different editors. Why? As you get acquainted with these editors, they will tell you more details about what they need for their particular publishing house. One of those conversations gave me the opportunity to write my first book--a children's book. While talking with the editor during a writers' conference, she said to me, "Terry, as a part of our company mission statement, we are to challenge children with the needs of the world. Yet in our full array of children's books, we don't have a single book which addresses this issue. What types of ideas do you have?" I had never heard or thought about this question before--but unknowingly through my writing and reading, I had been preparing an answer. At the time, Lion Books had a popular series of children's books from author Stephen Lawhead which combined real pictures with a cartoon character. This imaginative series evolved around a character named Howard and the books included: Howard Had A Hot Air Balloon or Howard Had A Space Ship by Steve Lawhead. After thinking for a few minutes about what to pitch to this editor for her need, I suggested, "What if we combined pictures from around the world with a cartoon character to show children they could grow up and go anywhere in the world?" Instantly the editor resonated with the idea and said, "That's a good idea, Terry. Please write that up and send it to me." I made a little notation about the idea and in the subsequent weeks I wrote a manuscript with the idea and sent it to the editor. While we went through a number of different versions, eventually that publisher offered me a book contract--my first. In 1992, a hardcover full-color children's book for children ages 4 to 7 was released. 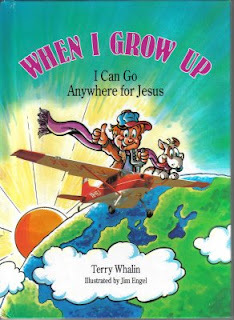 It combined real photographs from around the world with a cartoon character who moved into different occupations or jobs and was called, When I Grow Up, I Can Go Anywhere for Jesus. A long-time jungle pilot told me once, "We fly everything from pigs to Presidents." That phrase ended up as one of the occupations and panels in the printed book. This title marked my entrance into the world of book publishing. Thanks for telling the story, Terry. By the way, my first biography for kids is coming out this fall. I like biographies also. While I don't think this will be a major focus for me, I enjoyed it and it helped pay the bills! Thanks for such inspiring insite. i do have a question as a new author, is there agent representaion for new Christian children's book writers? If so, any suggestions? Thank you for the comment. It's a challenge for any children's writer to find a literary agent for representation. I explained the business details in this entry called Hope For Children's Writers. I hope it helps you. Persistence will be key.